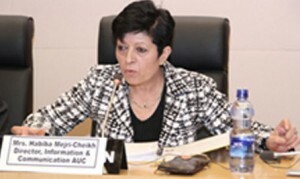 The African Centre for the Study and Research on Terrorism, represented by Ms. Nashwa Kamel, took part in a workshop for the validation of the AU Communication and Advocacy strategy (2013 – 2016), from 3 – 5 October 2012, in Addis Ababa, Ethiopia. The last day was dedicated to discussing the current status of the African Union Website and Social Media Presence as well as to endorsing the Draft Social Media and Website Guidelines. The workshop brought together communication officers in the AU Regional Offices, the AU Organs and Institutions, NEPAD, UNECA, RECs, the African Development Bank (ADB), the European Union, focal persons dealing with communication in the AUC Departments, the staff of the Directorate of Information and Communication of the AUC; Stakeholder and partners focal persons in communication. The workshop was organized to discuss the Draft Strategy and the Operational Plan which constitute the basis of the African Union Communication plan of action for 2013 – 2016 period aimed at ensuring an effective communication in the African Union, managed by the DIC in collaboration with all the information and communication officers within the AU regional offices as well as AU Organs, and the Communication and Information officers of the Regional Economic Communities (RECs) among others. The Communication Strategy is a plan-framework that comprises a combination of reactions capable of influencing necessary changes with regard to knowledge, opinion and behaviors of the targeted population, with a view to resolving a development problem, following a given agenda. The draft communication strategy is based on a study conducted by the Directorate of Information and Communication. The study clarified the role of communications towards the realization of the missions of the AU Commission as a management function that should be central to the work of the Commission. It is a shared responsibility involving officials and staff at all levels. And it demands cooperation and coordination within, between and among the institutions and departments of the Commission. Communication as a management tool: an example of ineffective communications that led to the damaging of the image and reputation of the AU, the failures in conflict management, especially the handling of some crisis such as in Libya and Côte d’Ivoire. Weak communication inputs: the issuance of press releases, communiqués and reporting on activities is not strategic enough for an organization as important as the African Union Commission. Their view is that very often, they have instead magnified the AUC’s failures and inconsistencies at the expense of its achievements. Use of Social Media: the AU operates a website; Face book and Twitter are now part of the social media network at the AU. The AU website still lacks good editorial supervision. Senior staff members complain that outlook and Intranet are more or less a “dumping ground for material irrelevant to their work and interests. The Duplication of communications activities: several heads of AU operational departments raised the urgent need for clarification of the Commission’s advocacy policy, the framework and guidelines for action and the streamlining of messaging. They recognized that the duplication of advocacy activities by respective Departments brings new constraints to news production, messaging and information flow within and outside the Organization. Others argued that it is due to the absence of an integrated and harmonized social media policy that several divisions decided to run their own domain names and operate their own websites. 4. Create and animate a framework for regular interaction and effective communication with AU Members and the RECs leading to the signing of the Protocol on relations with Member States and the RECs. Outcome of the workshop will be used as input to the draft Communication Strategy to ensure an all-inclusive strategy for 2013-2016. Then it will be submitted to the AUC Leadership for final approval before starting the implementation phase of the strategic document for sensitisation of public opinion on AU programs and activities.